Joyner Lucas, is from Worcester, MA and was nominated for two Grammy's in 2019: "best rap video" for his viral hit "I'm Not Racist", and "best rap song" for his song "Lucky You" with rapper Eminem. 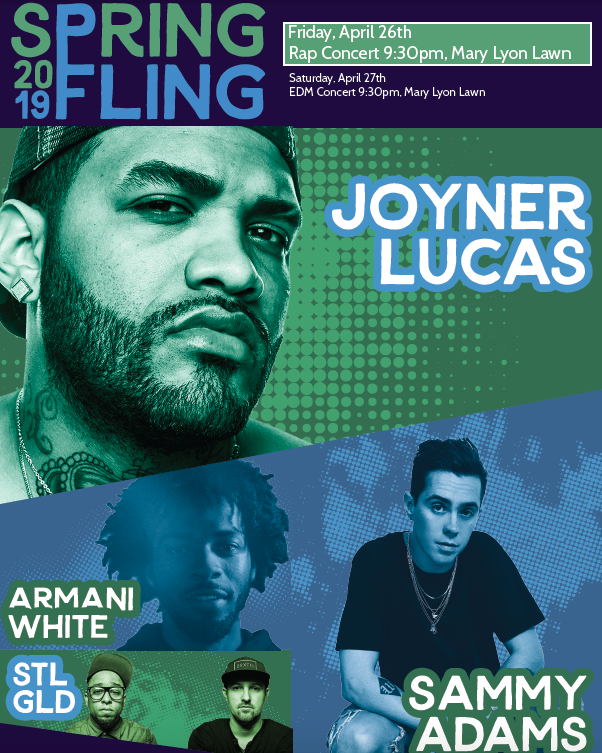 The special guest artist hailing from Boston, MA is Sammy Adams; he was selected by an artist poll that went out to campus this year, and performed on campus as the Spring Fling headliner back in 2015. Opener Armani White is a rising artist out of Philadelphia. Opening act STL GLD won "live artist of the year" at the 2018 Boston Music Awards and was just named "Boston's Best Band" by Improper Bostonian magazine.